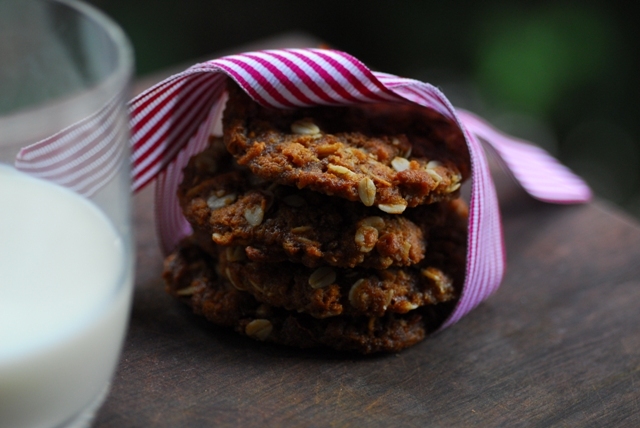 Anzac Biscuits are super delicious, give them a try. In a saucepan on low heat, place the rice malt syrup, water and butter. In a bowl place the flour, sugar, oats and coconut. Once the butter has melted and is bubbling with the syrup, add your bi carb and stir through thoroughly. Tip saucepan contents into bowl and mix through. Shape mixture into walnut- sized balls and pop, well spaced, onto the baking tray. Bake for 8-15 minutes, or until golden brown – it will vary quite a bit depending on fan forced ovens or not or gas… Just have a little look at 8mins and go from there. Take out of the oven and cool completely before eating. If you can. My hubby and son couldn’t! These biscuits get harder as they cool and will keep in an air tight container for 4 days. p.s remember if you can’t do gluten at all or are worried about oats, I’ve created a delicious and crispy alternative. Click here. And why not make yourself a luscious winter defense hot chocolate or warm spiced almond milk to enjoy alongside the bikkies?